Former Deputy Secretary of the US Department of Health and Human Services Tevi Troy, who is also President of American Health Policy Institute, joins Jason Hartman to discuss his newest book, Shall We Wake the President? : Two Centuries of Disaster Management from the Oval Office. The two examine some of the best and worst presidents in terms of handling disasters. One president makes both Tevi’s “Best” and his “Worst” list because of two very different responses to two drastically different scenarios. 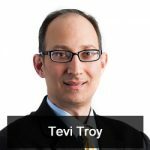 Tevi also takes a look at what current president Donald Trump might do when/if a disaster takes place. Jason also tries to get the former Deputy Secretary to discuss the possibility that the Republicans might actually be able to show an Obamacare replacement that Democrats might actually support, and that would actually improve our system. When in doubt, ask Mr. Trump.